What shall it be? A tale of madness, of terror, of dark deeds in far lands? I have them here. All the stories that ever happened, and many that have yet to come to pass." 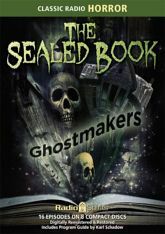 A padlocked, voluminous tome is thrown open to chill your spine with mysterious stories of the supernatural and the unknown�of hidden knowledge lost to the ages�of untold, unknowing fear. Your narrator, Michael Fitzmaurice, introduces you to the Keeper of the Book (played by Phillip Clarke) who brings you sixteen edge-of-your-seat thrillers produced by radio legends Robert Arthur and David Kogan! Maurice Tarplin, Ed Latimer, Alfred Shirley, Bryna Raeburn, Elspeth Eric, Tony Barrett, and more are featured in these frightening fables.